Andres Roots Roundabout: Swedish Gigs Coming Up! Along with the winter, Roots & Terep's Trad.alt.winter Tour is coming to an end: after five shows in Finland and five in Estonia, the last gigs of the tour will take place in Sweden on March 14th & 16th. 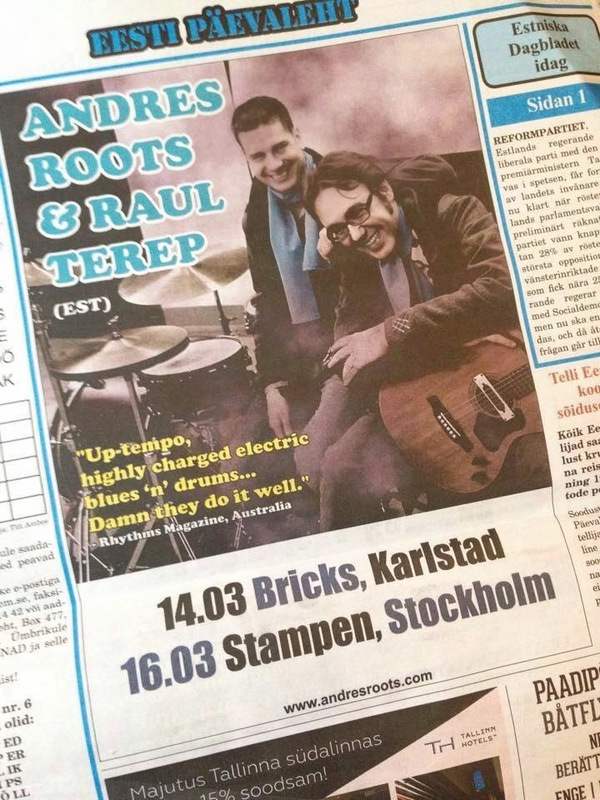 On Saturday, March 14th, the duo will play their first-ever show in Sweden at Bricks in Karlstad, with special guest Bert Deivert - and on Monday, March 16th, Roots & Terep will appear at the legendary Stampen jazz club in Stockholm with Brian Kramer. Towards the end of the month, Roots & Terep will play two "non-tour" concerts at the celebrated Tallinn Music Week festival in Tallinn, Estonia, appearing "unplugged" at Liina Viira's designer boutique in the afternoon of March 28th and then with full firepower at the jazz club Philly Joe's later that same evening.